No. 94. Amerapoora. Pyathat of Kyoung No. 93 [Maha Too Lo Bounghian Kyaung]. bl.uk > Online Gallery Home	> Online exhibitions	> Asia, Pacific and Africa Collections	> No. 94. Amerapoora. Pyathat of Kyoung No. 93 [Maha Too Lo Bounghian Kyaung]. 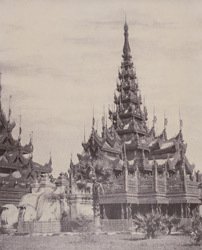 Photograph by Linnaeus Tripe, from a portfolio of 120 prints, showing the pyat-that or multi-tiered wood pavilion of a kyaung (monastery) at Amarapura in Burma (Myanmar). In 1855 a British mission was sent to King Mindon Min of Burma to negotiate a settlement regarding Pegu, annexed by the British following the Second Anglo-Burmese War in 1852. Linnaeus Tripe was the official photographer on this mission, his pioneering architectural and topographical views of the country are an important photographic record. Amarapura, on the Irrawaddy (Ayeyarwady) river, was twice the capital of the Burmese kings of the Konbaung dynasty: from 1782 (the year of its foundation by King Bodawpaya) to 1823 and again from 1837 to 1860, after which Mandalay, 11 km to the north, became capital. Amarapura was the site of the first British Embassy to Burma in 1795, and played host again to Tripe's Mission.